I’m pleased you like this, Naomi, anad thanks for visiting! Hope you and yours are all well and enjoying this change of seasons. It’s warm here yet, but rains started. I got a kick bike for birthday present and I go all over the horizon. Daily the temperature is more than +15 C, usually toward the end of September it is closer to +10 C. Summer started late too. But leaves have started their *ruska* color already. Ripsa, I’ve noticed in the news that summer came late to Finland. Enjoy your ‘ruska’! We’ve certainly had very mixed weather the past few weeks, with windstorms and lots of rain alternating with sunny days. Last night went down to 9C so it is time to begin bringing in some of the more tender potted plants and take cuttings of the geraniums. Oh, what is a “kick” bike? Marja-Leena, if you Google KickBike or KB and Finland, you might get the bike, but maybe better saying KickBike, Suomi. It’s a biketired thing, in Finnish potkulauta, which doesn’t have a seat, but a metal place for one or two feet, depending on the model, front tire is bigger and the bag tire small. I got the KB because I don’t dare to drive bike any more after I fell and broke all these bones 2 yrs ago. I know many people, who know the planner and the producer of this KB in Oulunkylä, Helsinki. I heard that they export it to some extent also to North America. The original idea of this strange vehicle is that people get a chance to practice going on sled before winter comes, in Spring, Summer and Fall. Now it’s Fall, so it’s exactly a right time! Oh, I recognize the old-fashioned ‘polkulauta’… some children on our street have that, just a board on small wheels to stand on with a vertical stem in front with handle, and one kicks it along with one foot on the side. So this “kickbike” (http://kickbike.com/) has a large bicycle tire in front and smaller in the back. I don’t think I’ve seen that around here – looks like fun! I was surprised that there were no signs of autumn colour in the north west of Scotland, and indeed found none until the south east, where dry cold winds blow (how I remember those winds!). We have the beginnings here, with accompanying morning mists, but it is still incredibly mild. I slept badly last night because I was so hot! And my borlotti beans – only one of two crops I planted – are still not ready to harvest. Strange days. I love your image and the colours therein. Olga, that is interesting about the lack of autumn colour in NW Scotland – are there no deciduous trees there? It’s still early days here for that except some of the maples that are turning, partly due to the summer drought perhaps. I’m glad you like the image and colours. I’m not sure what this plant is, something that grows wild in the midst of my ‘forest’ garden. I spotted just these two coloured leaves peaking out from the middle of a creeping woody vine, as if in invitation. Yes, there are lots of deciduous trees, but they had not turned yet. Your leaves remind me of the many wild geraniums (the true geranium rather than the tender pelargonium which are widely called geraniums) which self seed in our garden. I’m rather fond of them. I’m not sure that their leaves exactly match your image. I shall pick some tomorrow to check. It depends on the size of your leaves. I have picked some of ours – Herb Robert is the name. The leaves and flowers are tiny, but they can be a little larger when they establish a larger plant, and they self seed like mad. As I say, I love them, but Nigel pulls them out whenever he sees them. Nonetheless I’m delighted to say that they persist. https://en.wikipedia.org/wiki/Geranium_robertianum. The stems are slim but robust. 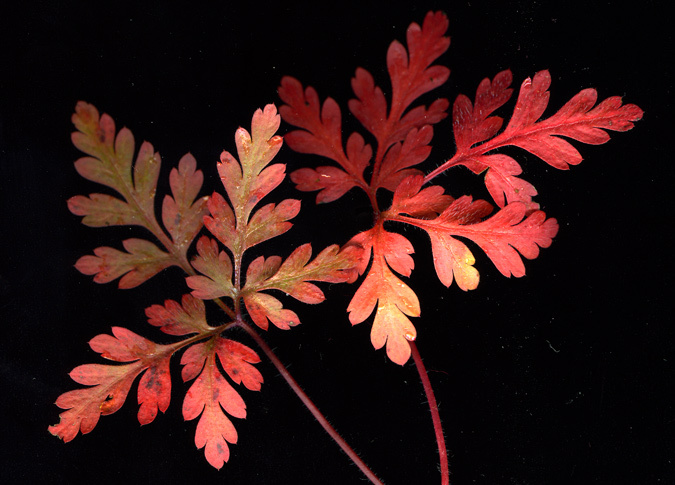 Herb Robert, what a lovely name, and it does look like it, thanks to your photos sent separately! Always fun to learn more about the plants in our world. Back later, just in from the garden, spotted some smaller ones of this plant in flower, like your photos! The clippings above are larger but obviously the same, but perhaps growing in better soil and being more mature? Elegant leaves in clear reds and yellows look wonderful against that velvety black background. So far it’s remained warm hereabouts, but we can tell from the berry bushes that autumn will soon be making an appearance. Of course, the late night sound of students returning from the bars on weekend evenings is another sure sign of seasonal change. Susan, glad to hear that your early fall days are pleasant even if somewhat noisy from inebriated students! That black background, as you know, comes from the scanner having its lid open when scanning 3D objects. I do like it too. Thanks for coming by–I’m sandwiched between two trips, and flailing about, trying to get the house and more in order. Thank YOU, Marly, for coming by to visit this very lazy blogger! Shall see what you’ve been up to when I come home again!